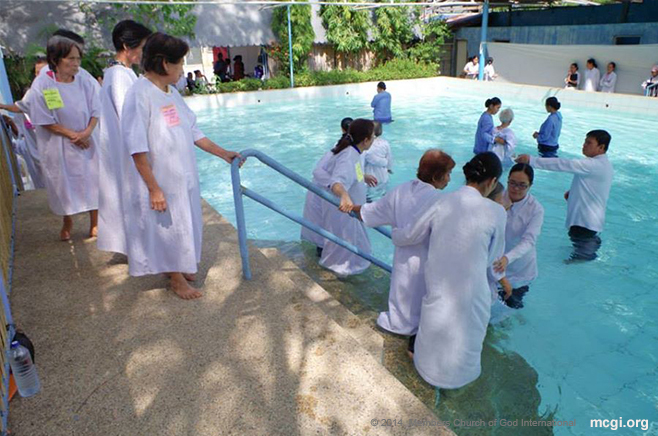 Read short testimonials of faith from some of MCGI’s youngest brethren baptized on February 19, 2016 at the Ang Dating Daan Convention Center in Apalit, Pampanga. I want to be saved. I want my spirit and soul to be saved. I was able to listen to Bro. Eli via radio and television. It has been since a long time ago actually. Perhaps they were still on SBN 21 back then. I felt light and kind of reenergized. I hope that their lives will be longer that many more souls will be saved. I want to be close again with the Lord God and that I may have trust in Him again. I was able to listen via the Internet, and also when I accompany my parents whenever they attend Church services. I follow everything that [Bro. Eli and Bro. Daniel] say, and I felt that I really needed to bring myself closer to God. It was different at first. But now I really felt the love of God for me. Sis. Mary’s Mother: Her father is already 20 years old in the Church, while I’m only one year old. Our two children are already three years in the Church, and she is my youngest. I feel so different now than I was before. I feel different now; I feel lighter inside. I hope that they will become stronger then they will be able to continue helping people. Thanks be to God! Sis. Sherellyn: I learned the words of God. Sis Arsenia [Sis. Sherellyn’s sister-in-law]: We learned about it through my brother. Also, when I was a child I remember my father listened to Bro. Eli. That’s why I’m familiar with the teachings and the doctrines. And that’s why it was very easy for us to be encouraged to join here. We really believe in Bro. Eli’s explanations. They’re really true and of God. He’s on-point in the Bible, and the explanations about it are very well. That’s why we decided to get baptized. Sis. Sherellyn: I felt happy. Sis. Arsenia: It feels good inside. It’s like your problems are gone. It’s like now, our problems are going to be solved easily: All we have to do is call on the name of Jesus Christ. Sis. Arsenia: We are thankful because it’s through him that we learn things in the Bible, whatever word of God that we can benefit from, like doing good to others. Sis. Sherellyn: I am thankful also because we have felt the truth. This should’ve happened a long time ago; only, I had work then. I couldn’t leave work, so I persuaded my wife to go on with it. I heard [from Bro. Eli] that serving idols is prohibited, but why is it in Catholicism there are many? They even parade those around. There’s the black rosary, the black Nazarene; I asked, “What is that? A burnt saint?” That’s why I did not anymore attend in Catholicism. Actually, in myself, really know the reason; that’s why I got baptized here. I didn’t really know the true Church then. Here, the doctrines are according to what is written, because there are many prohibitions. I felt light. Before, even moving my body was a task, as I have an ailment. I hope that they will continue the more in preaching that many more people will be encouraged and believe. It’s because of the teachings that I heard from Bro. Eli. I’ve been listening to Bro. Eli for a long time now, since the days of Don Manolo’s program on DZRH. However, it wasn’t continual. My two siblings though became members already. I would listen to it nightly on DZRH; he and Don Manolo would exchange thoughts. Only, perhaps because of being busy with everyday life here on earth, and in watching football, I wasn’t able to continue listening. That was in the ‘90s already, because that’s the time when we had cable TV. When there’s cable, there’s European football. During indoctrination, I was really eager to listen, as I really wanted to. It’s like I encouraged myself to do this. Perhaps, it is also the calling of the Lord. Our youngest is just a new member. Our second was just last December. I can’t recount how old in the Church our eldest is however. I felt relief in my body. That’s what I felt. Even the hunger that I felt before was gone; I can’t explain it. I hope that their lives will be longer. I also pray for them. It’s because what Bro. Eli says is truly not coming from his own. It comes from a source that isn’t mortal.